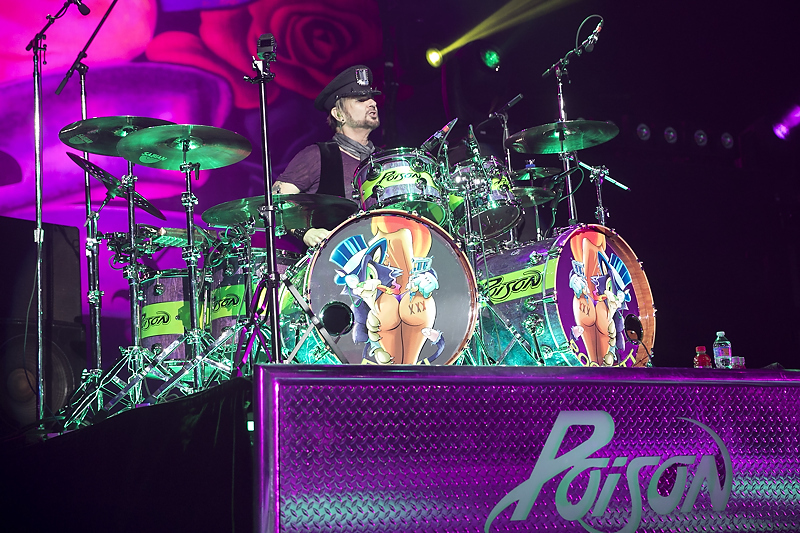 Poison rolled into Oracle Arena on Tuesday night fresh off a string of successful tour dates with Def Leppard. The four-piece, made up of Rikki Rockett, Bobby Dall, C.C. 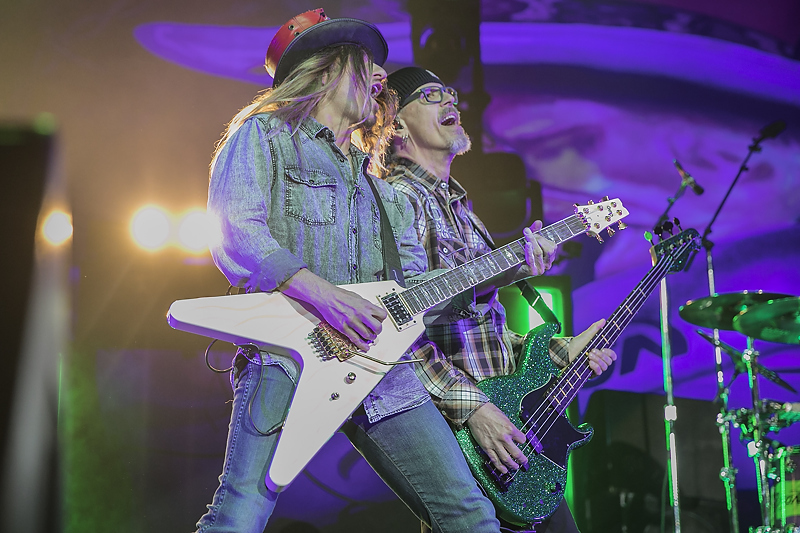 DeVille, and Bret Michaels, delivered a powerful performance of hit songs from their back catalogue showing that the band is still going strong 30+ years into their existence. 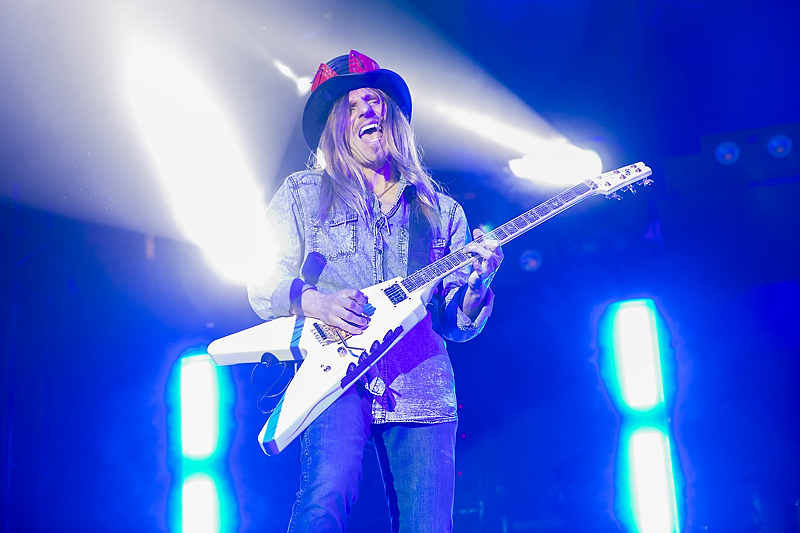 Poison opened the night with the fast paced one-two punch of “Look What the Cat Dragged In” and “Ride the Wind,” two hard-edged rockers that really got the crowd moving. 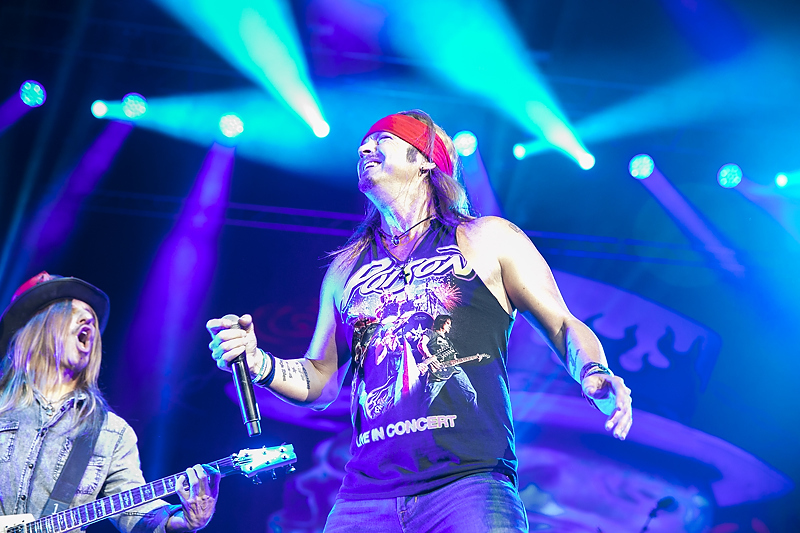 Bret Michaels displayed his mastery over the audience from the onset, imploring them to sing along and dance to the music. It was the next song, the rocking “Talk Dirty to Me,” that got the crowd into full blown sing-along mode and was the first big highlight of the night. Powered by a memorable opening guitar riff from DeVille, the song was meant for the arena stage with his basic yet driving rhythms and strong vocal line from Michaels in addition to a simple yet evocative guitar solo from DeVille. A few songs later Michaels donned his acoustic guitar for the power ballad “Something to Believe In.” Michaels dedicated the song to all the men and women currently serving in the armed forces and implored the crowd to raise their phones up in unison with the music. 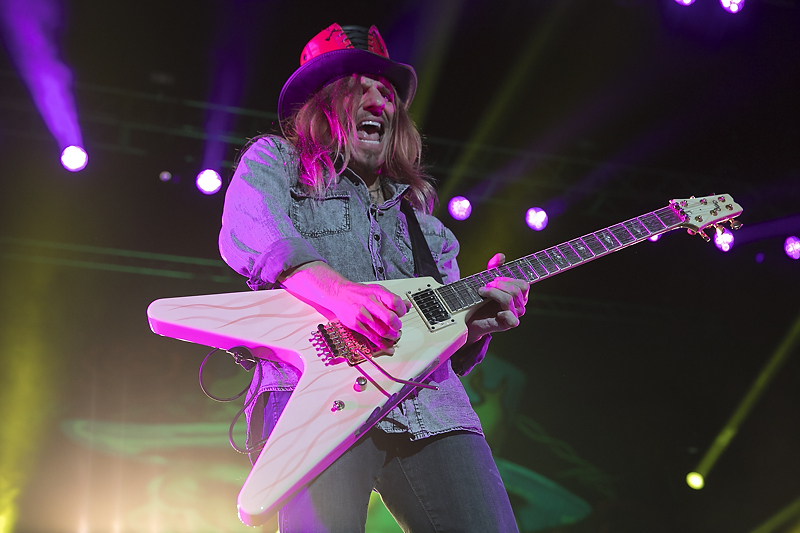 The song switched between gentle acoustic strumming to pounding rock, with DeVille dishing out some of his most lyrical and moving solo passages of the entire concert. 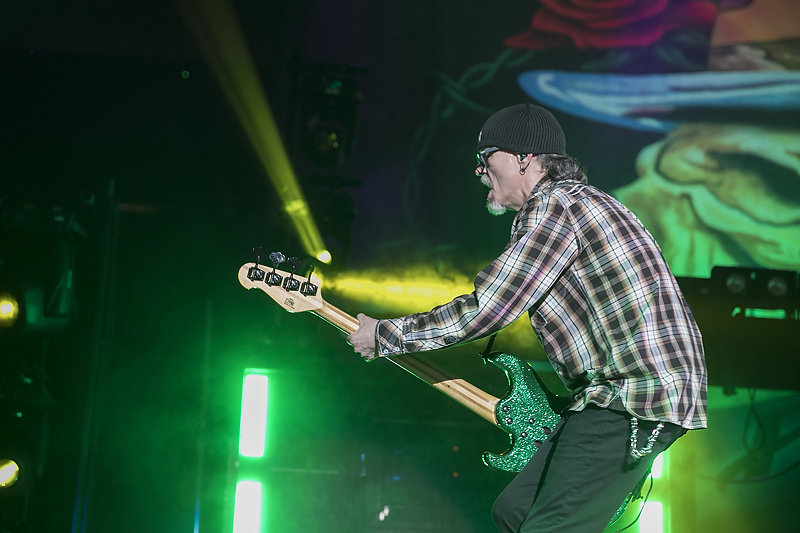 To bring the energy back up, Poison followed up the ballad with the blues-rock of “Your Mama Don’t Dance,” a song made famous by Loggins and Messina in the 70s. The piece started out with a furious harmonica solo from Michaels before swinging into full tilt boogie driven by Dall’s smooth bassline. Following a series of song-ending solos, DeVille ripped straight into an extended, unaccompanied solo that lasted for several minutes. This gave DeVille a chance to branch out and show his dazzling command of his instrument: blending all types of hyper-speed runs and other guitar acrobatics into an interesting and captivating solo. What makes the song so memorable and evocative after all these years is its perfect combination of a stripped-down arrangement with a direct and meaningful set of lyrics. The theme of loss and heartbreak is a universal human sentiment and Michaels delivers these feelings in a direct and powerful way. This is merged with plenty of strong instrumental backing from the rest of the band made for a fantastic performance of the song, especially DeVille’s gut wrenching solo work, easily his best of the night. Poison threw in an interesting twist for their encore – a revved-up cover of the Kiss classic “Rock and Roll All Nite.” It was an inspired and fitting way to close out the evening on a high note and once again showed that Poison have not missed a beat on this tour (their first major tour in 6 years) and will continue to be one of the top acts on the arena rock circuit for a long time. For more information on Poison, go here.